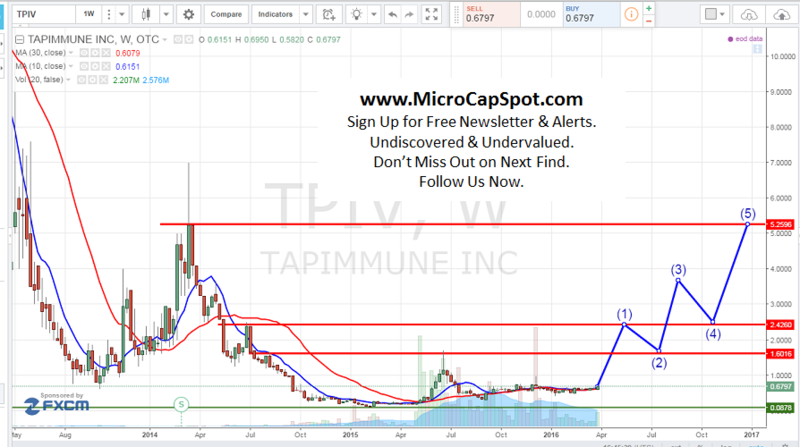 TapImmune Inc. (OTCMKTS:TPIV) is about to make significant headway with its unique vaccine PolyStart. The company announced it would be partnering with Mayo Clinic to test not one but two vaccines. These vaccines could potentially help the human body defends itself against certain types of breast, ovarian, and lung cancers. This market is valued in the billions of not hundreds of billions. It plans to initiate a clinical trial involving 280 patients for on the vaccines this summer. PolyStart is extremely versatile and it has unlimited application potential in oncology and infectious diseases that do not have to be solely based on TPIV’s platforms. It can be applied to many others through licensing which will be beneficial to the company. TPIV is moving ahead with its Phase 2 trials and it fully expects to develop PolyStart as a stand-alone therapy. As a secondary strategy, the company will use it synergistically with their peptide based vaccines for breast and ovarian cancers. The patent claims are centered on TapImmune’s proprietary PolyStart™ technology. This is a platform for the next-generation vaccine technology for the treatment of cancer or infectious diseases. According to the lead research, it elevates the expression of any one or a multiplicity of T-cell antigenic epitopes by a factor of 4 or greater. As seen on the company’s website, TapImmune Inc. (OTCMKTS:TPIV) is an immunotherapy company specializing in the development of innovative technologies for the treatment of cancer, including metastasis, and infectious disease. The Company’s peptide or nucleic acid-based immunotherapeutic, comprise one or multiple naturally processed epitopes (NPEs) designed to comprehensively stimulate a patients’ killer T-cells, helper T-cells and to restore or further augment antigen presentation by using proprietary nucleic acid-based expression systems. The Company’s technologies may be used as stand-alone medications or in combination with current treatment modalities. TPIV is currently trading at a $46 million market valuation. The company has announced several new developments including the initiation of its phase 2 trials. Any glimpse of positive news will send shares up significantly. The stock currently trades at $0.71 and has gained over 4% in intraday trading. Institutional ownership sits at 5% and the stock has a beta of 1.90. We will be updating on TPIV when more details emerge so make sure you are subscribed to Microcapspot so you know what’s going on with TPIV. Disclosure: we hold no position in TPIV either long or short at the publication of this article.